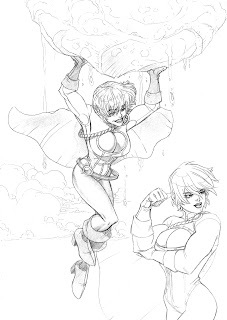 Scary Happenings - The Art of Nick Bradshaw: DC Gals from an old sketchbook! DC Gals from an old sketchbook! Dusted off an old sketchbook I started a year ago. Made ten pages in before shelving it, figured I would tear these pages out and start over. These were a couple I was "ok" with, i prefer the looser stuff ( s'why i switched from a sketchbook which feels like such a commitment to loose paper which you dont mind chucking in a box when you are finished). Awesome sketches. Any chance you'll publish a sketchbook someday? Fantastic! While they are all great, that Ivy Picture is my favorite. I second the motion for a sketchbook too. That Poison Ivy is awesome, Nick!